December | 2018 | Friends of Fort Caswell Rifle Range, Inc.
Owen Ransom Mintz was born and raised in Brunswick County, NC. He was the eldest of four brothers, all serving in WWI. Forney Boston Mintz was the first to enlist in the US Army in 1913 at age 21. 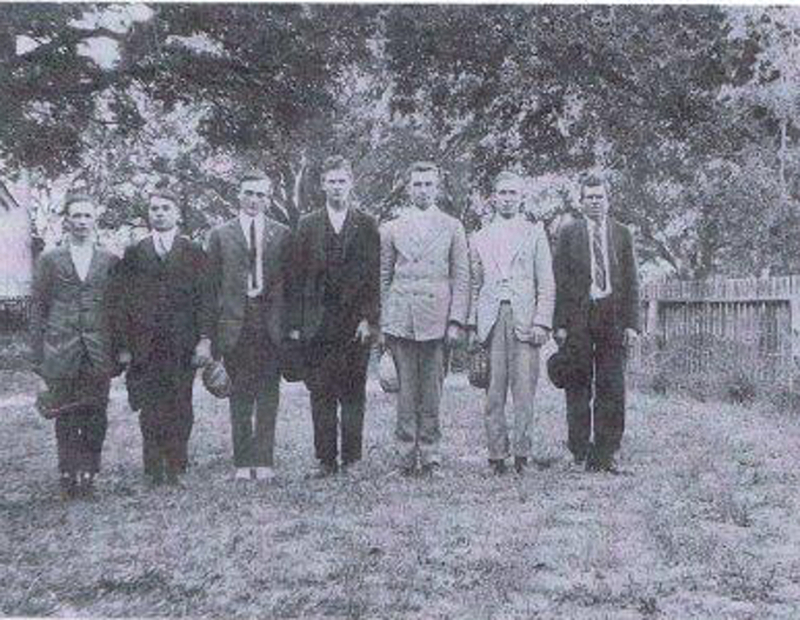 Half brother Samuel Leob Mintz enlisted in 1916; Martin Newman Mintz and Owen were drafted. All four brothers served overseas. Like Martin, Forney and Owen were wounded. He was ordered to report for duty on October 15, 1917, with the other six men shown in the above photograph. All were sent to Camp Jackson, SC, and officially accepted on October 26. [Source: ancestry.com], then assigned to Company F, 322nd Infantry, 81st “Wildcat” Division, but as previously included in the 81st Division history, many soldiers were transferred to other needed divisions. On February 5, 1918, Pvt Mintz was assigned to Company C, 11th Infantry, 5th Division. The previous posts describe the creation of the division and activities up to the taking of Frapelle, and finally the operation at St. Mihiel, the first all-American operation of the war, which was a success. The 5th Division had lost many men, which meant green recruits were added to their ranks and required training. Their camp was in Foret de Hesse, 15 kilometers west of Verdun and 20 kilometers below the current front. They would soon be called upon for the first phase of the Meuse-Argonne Offensive. The sector on which the Division was embarking had been the scene of terrific fighting since the launching of the assault on September 26. American bombardments and barrages and German counterfire had converted the open ridges, ravines and slopes into stretches of churned and shell-torn earth. The wooded areas, dense with the tangled underbrush, looked as though they had been struck by fierce cyclones. The villages of the areas were wrecked and ruined. 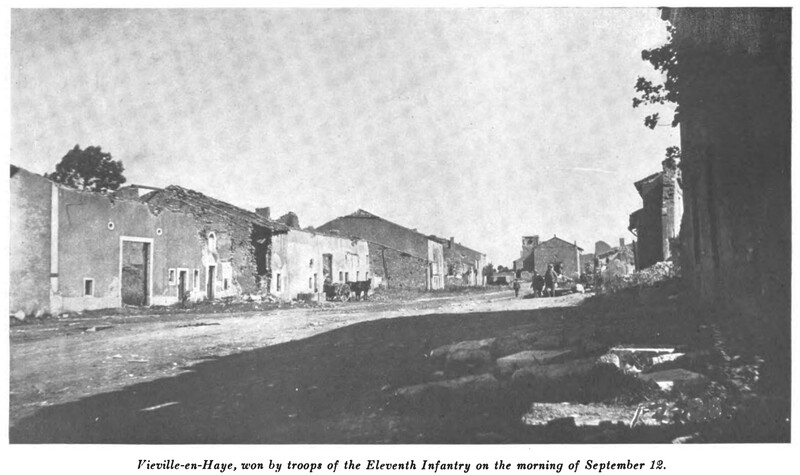 [On October 11] The front was reported to be from the neighborhood of Cunel eastward along the road to Brieulle. From the very first entrance of our troops into the area they were subjected to harassing shell-fire. Inasmuch as the sector was only a few kilometers west of the Meuse and throughout its entire length was visible from the eastern heights still in the hands of the enemy, his artillery sheltered in those hills could constantly deluge the whole region with gas, shrapnel and high-explosive. The Division had suffered severely from its exposure to a day and a half of continuous shelling. Their first attack was set for October 14 at 8:30am. The Tenth Brigade (6th and 11th Infantries) were selected as the assault brigade. The operation from the start promised to be a hard one. At dusk, the troops moved up toward their positions for the operation and took their assault formation. Assault battalions found that the jumping-off line at the front was three quarters of a kilometer south of the one specified in the attack order. Then it was discovered that the 32 Division which was to protect their left flank had orders to begin at 11:30am, thereby exposing the 5th Division on that side. Furthermore, an American deserter had informed the enemy of the attack. [Before the attack had started], the Germans put down the strongest counterfire the men had ever seen. For two hours, the positions of the assault battalions were raked with high explosives. At 8:30am the assault was launched with vigor and courage, despite the punishment that had just been undergone. The men still remembered the victorious rush at St. Mihiel and dashed forward impetuously. But it was a different enemy here, one who was sticking till the last and fighting for every foot of ground. [Due to the confusion earlier of the jumping-off point] our own artillery barrage had not been close enough to our lines to be effective and our battalions looked down into Ravin des Perrieres and at the Romangne-Cunel road, thickly populated with German machine gun nests. After many feats of courage and gallantry and many losses, the only possible action was to dig in. The afternoon was spent in organizing the dearly won lines, in connecting shell-hole to shell-hole by shallow scooped-out-trenches. Our men lay in the shell-holes scattered over the entire area of advance. The intense shell-fire and barrages had inflicted casualties that for the day’s fighting surpassed the thousand mark. The attack on Bois des Rappes was ordered to be continued at 7:30am of the 15th. After another confusing day with erroneous reports such as one that all officers were killed, no new attack was ordered for October 16th. Time was spent organizing and planning. October 17th was spent solidifying the front. The Division’s Command was relieved and replaced. Small combat troops were employed on the 18th and 19th, and an attempt at a direct attack was made on the 20th. Six days of fighting had failed to conquer Bois des Rappes. It was evident that only a surprise attack could force the enemy to give up the place. New command for the 11th Infantry planned the surprise attack on the 21st. The battalions were stealthily filtered up to the attack line, the artillery shelled the front lines for only 5 minutes. At 11:30am the assault plunged forward and literally overwhelmed the Germans on the front lines. The surprise was a success. Finally, the enemy was routed. Bois des Rappes was won for good. Command of the sector passed to the 90th Division. The 6th and 11th Infantries withdrew to the zone south of Montfaucon and buried their dead. Bois des Rappes had turned into a glorious victory, after a withdrawal due to misunderstanding of circumstances. The casualty list of the Division was 20%, 4,449 men. Fifty-one officers and 728 men had given their lives. During those eleven days men and officers alike had existed under the most trying and wearing conditions. Throughout almost all the period there had been rain, which kept clothing wet and rendered battlefields “seas of mud.” The chill of autumn was in the air and the warmth of a fire was never possible in the open under the observation of the enemy. A shelter tent stretched over a shell-hole half filled with water was all the protection that could be had against both artillery and weather. Food reached the front lines cold and in insufficient quantities. Water was very scarce and often contaminated. Practically every officer and man was suffering from diarrhea and exposure. Pvt Mintz was slightly wounded on the surprise battle detailed above. He would remain in France and return with his Company on July 11, 1919, presumably serving in the Army of Occupation with the 5th Division. He was honorably discharged on July 26, 1919, with a 10% disability. No details were found describing his wound, recovery, or the source of his disability. The 1920 Census shows him living at home along with his brothers Martin Newman, Forney Boston, and his sister Mary. He would continue to work on the farm and never marry. On April 26, 1963, Owen ran off the road and was crushed by his truck. He was 76. Owen Ranson Mintz was laid to rest in Mintz Cemetery. A military headstone was installed. Herbert Burnell Ward was born and raised in Brunswick County, NC. Herbert’s WWI Draft Registration shows he was living in Ash, single, and working on his family’s farm. His registration included his previous service, one year at Fort Sherman. This was also handwritten on his NC WWI Service Card with the dates April 22, 1916 – May 21, 1917. Herbert had four brothers near his age. They were never called to duty. Willie Davis Ward was disabled due to a broken foot. Luther Lewis Ward was employed by the US Government as Mail Carrier, while John Butler Ward was a substitute carrier. George Brooks Ward Jr was too young for the 1917 Draft Registration but did register in September 1918 when the age range was expanded. Herbert was ordered to report for duty on October 4, 1917. He was accepted for service on October 15, 1917, at Camp Jackson, SC [Source: Ancestry]. A handwritten notation states that they were intended for the 322nd Infantry of the 81st Division, but as previously included in the 81st Division history, many soldiers were transferred to other needed divisions. On February 6, 1918, Pvt Ward was assigned to Company M, 11th Infantry, 5th Division. He had moved up and down in rank during that time, likely because of the shuffling of men where needed. On April 1, 1918, he attained the rank of corporal, which he would hold for the remainder of his service. The previous post describes the creation of the division and activities up to the taking of Frapelle. 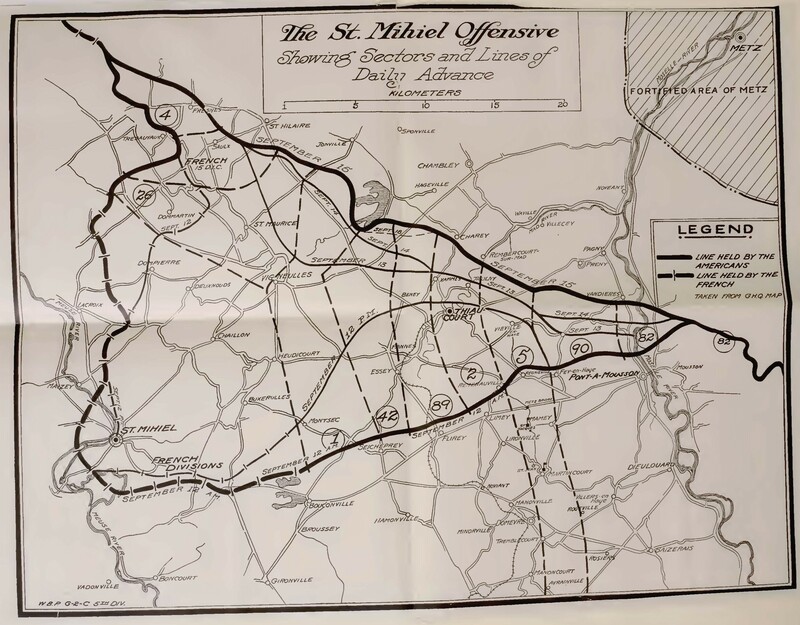 The 5th Division’s next operation was at St. Mihiel, the first all-American operation of the war. The American First Army was organized in August and September 1918. The training schedule emphasized open warfare methods. The use of maps and compasses, and rifle and machine gun firing was stressed, and the wearing of gas masks was enforced for training. The Division began a 50 kilometer march on September 4th. Absolute secrecy was maintained. All marching was between the hours of 8pm and 4am. No lights were permitted. By day the troops and trains remained concealed. The area around Martincourt was the destination of the Fifth Division. Those forced night marches stand out most vividly in the mind of every man in the Division. It was the first hurry-up march the troops had undergone; the weather was one continuous downpour of rain; the roads were slippery and wound over steep hills and through wet woods; as the organization approached the lines the traffic on the highways grew denser and denser until those arteries were solid-streams of vehicles and men, with a current in each direction. Orders were that the artillery should be in the sector and in position by September 8th; but the enormous traffic on the roads, the scarcity and wretched condition of the horses and the incessant rain made it impossible to complete the march on time. Forage was scarce, water was often unobtainable. Horses died along the road or had to be abandoned to the mercy of French peasants. 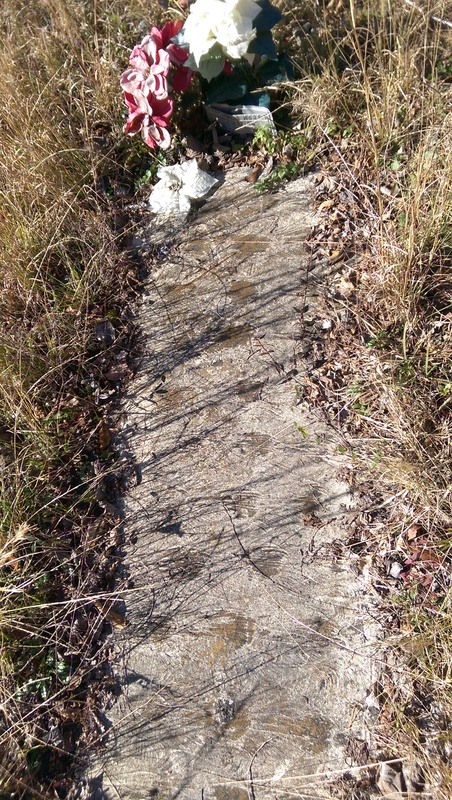 The muddy ground made the entrances and exits of woods extremely difficult; sometimes as much as three hours were consumed merely in getting organizations out of the woods and on the road. The strain on men and animals was terrific. Sleep was almost unheard of. Fourteen American divisions were gathered for the operation: 1, 2, 4, 5, 26, 42, 82, 89, 90; Reserve: 3, 35, 78, 80, 91. 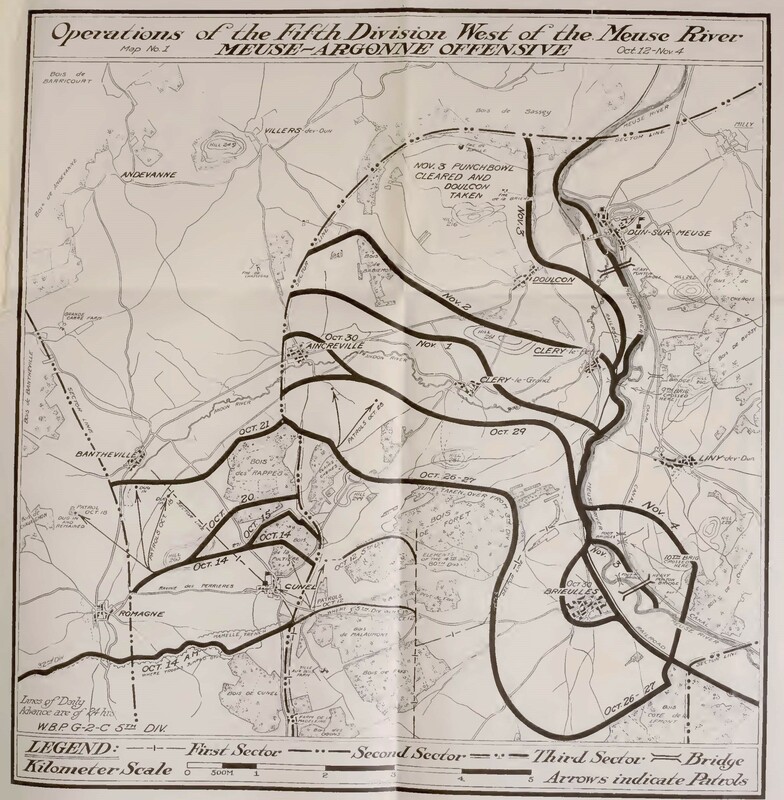 The objective was to reduce the German’s occupation of the St. Mihiel salient, or the triangular portion jutting out as shown in the map below. The plan was to cut it off on all sides with the various divisions. 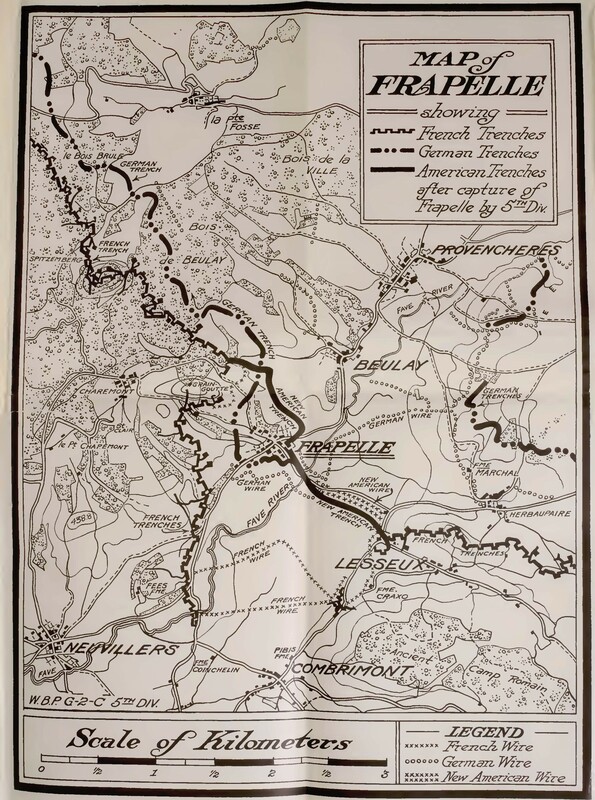 The Germans had been prepared for the possibility of withdrawal to the famous and supposed impregnable Hindenburg Line, which the 30th Division would break in their famous assault on September 29. But the Germans were still taken unaware. The blackness of the nights and the perpetual rain exhausted everyone. The Military Police especially were called upon for supreme effort, for they had to act as column markers throughout the night and then spend the ensuing day getting in position for the next stage of the Journey. Officers and men alike were footsore and weary from exposure to the raw weather and loss of sleep when the brigades reached their designated stations. The 5th Division was assigned to drive practically due north, about 8 kilometers, to the Hindenburg Line. The German positions that faced the troops of the Fifth Division were excellently situated for defense. They included four successive heights, three of which were defended by well organized systems of trenches. Each of the heights commanded several valleys where enemy reserves were stationed and from which counter attacks might normally be planned should the heights be taken. The Germans had foreseen the attack and had prepared for withdraw. But the attack came 48 hours before it was expected, so the assault caught the Germans as they were beginning evacuations. Because of the secrecy of the attack, the Americans faced reduced resistance. By midnight before the morning of September 12, the troops had reached their posts for the attack. At 1am the bombardment began. The roar of cannon was deafening and bursts of flames lit up the sodden sky. At first the Hun artillery attempted to reply, but by 1:55 am their last gun was silent. 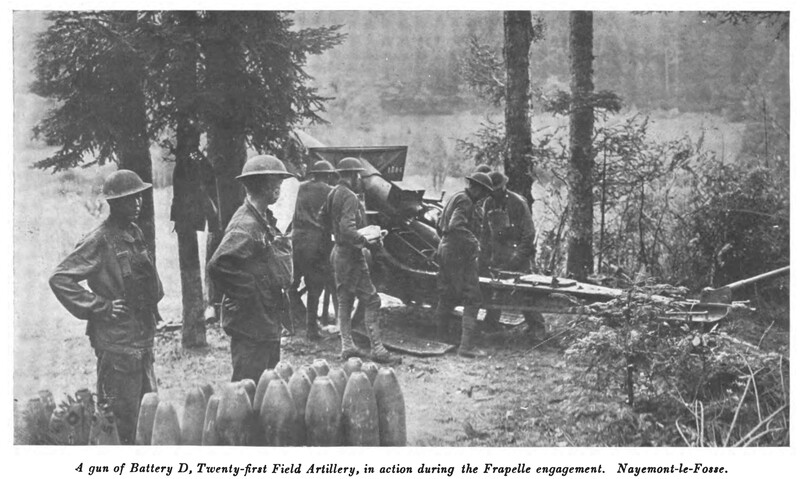 Doughboys waiting in the trenches were impatient of the delay. Already all except the forward strands of defensive wire in front of their jumping-off trenches were cut to speed their advance. The rain soaked everyone to the skin. H hour was 5 am. At 4:30 the machine guns all opened up a heavy barrage of indirect and overhead fire on the points in the German lines when counterattacks might come. At the instant that the barrage came down the Doughboys dashed forward. Four thin waves of mud-stained men, helmeted and under full pack, bayoneted rifle in hand, swept through the lanes in their own barbed wire. It was not quite dawn. The enemy “must have quaked as the avalanche descended upon them.” Frantic calls by them for counter-barrages were unanswered. Machine gunners had difficulty in keeping pace with the fast-going Doughboys. The unwieldy tanks struggled to catch up, but floundered in the mud and shell-torn stretches of No Man’s Land. German prisoners taken by the infantry began arriving at 6:15 am. 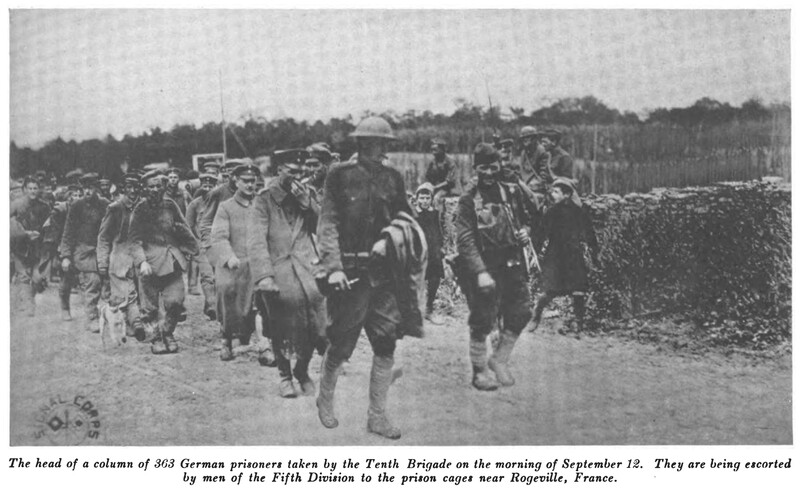 The photo below shows prisoners taken by the Tenth Brigade (6th and 11th Infantry) being escorted by the 5th Division. 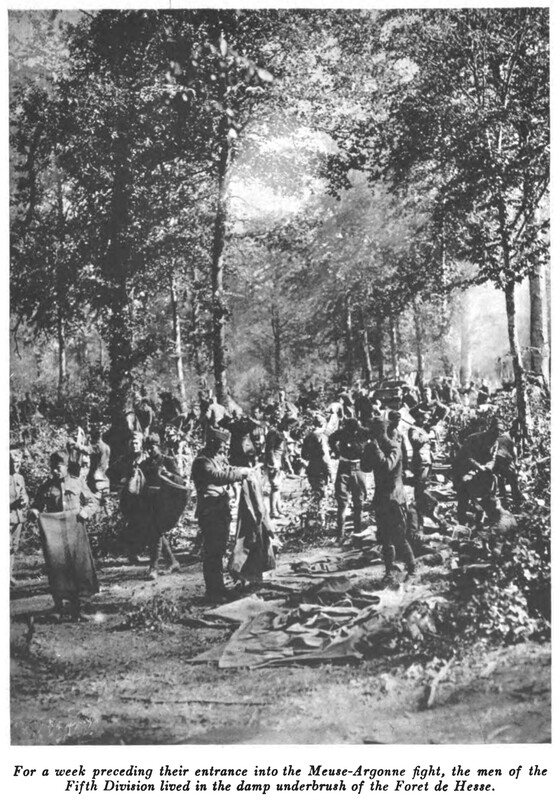 Ultimately, 1,210 enlisted men and 32 officers were taken prisoner by the 5th Division during the operation. Cpl Ward and the 11th Infantry descended on Vieville, taking the town. Dressing stations were opened, caring for the wounded and serving hot coffee, bread and corned beef, and chocolate to tired soldiers. The orders were “Press advance to the First Phase Line. Rush digging with great vigor.” The advance pushed on. The 6th Infantry met less resistance than the 11th. The troops had to cross open fields in the face of fire from heights where machine gunners were making a stand. The resistance of the enemy grew stiffer. The First Day Objective was reached and the troops began to dig in. Everywhere the first day’s operation of the American Army had been successful. Losses in the Division that day were heavy. 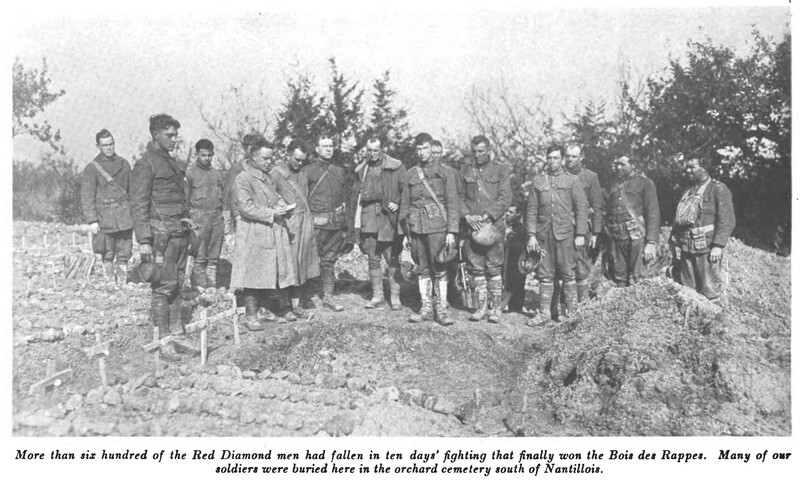 The 11th Infantry alone lost 3 Second Lieutenants. 3 more officers were KIA. 18 officers were wounded. 450 enlisted men were wounded. 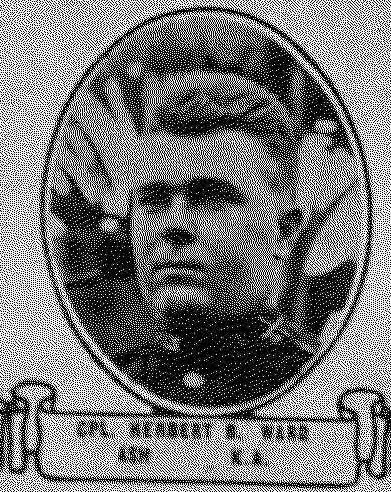 144 were KIA, including Cpl Herbert Ward. 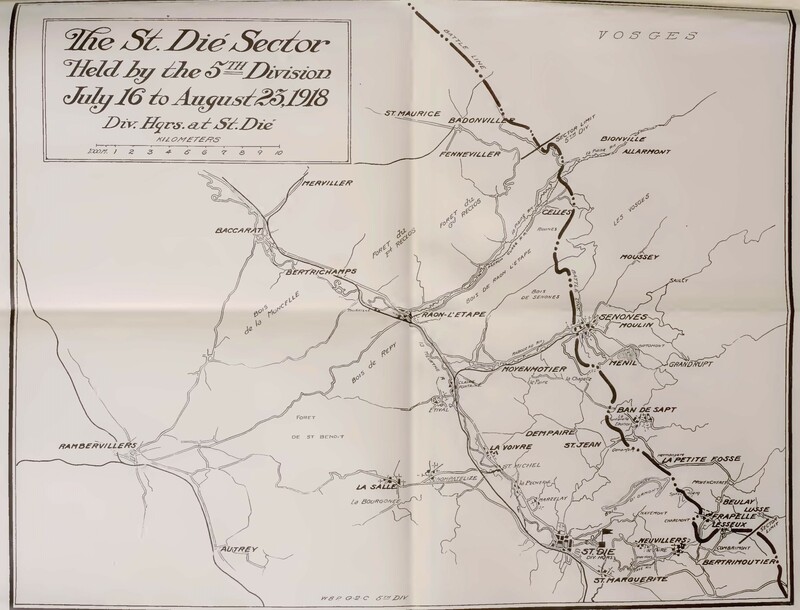 The Division would go on to end the successful operation, capturing the St. Mihiel salient and driving to the Hindenburg Line. It wasn’t won easily, as the enemy fought hard and continued targeting the Americans after being driven beyond the Hindenburg Line. In total, the 5th Division had casualties of 1,612 from September 12-16. Most were suffered by the 6th and 11th Infantries. Thirteen officers were killed, 44 wounded, and 11 gassed. The enlisted men had 305 killed, 1,123 wounded, and 116 gassed. Two were captured. The spoils won by the 5th Division were high: 25 77-mm guns, 4 105-mm guns, 13 150-mm guns, 7 anti-tank guns, 1 anti-aircraft battery, 30 trench mortars, 125 machine guns, 550 rifles, over 100,000 rounds of artillery and trench mortar ammunition, 65 horses, 30 flat cars, several miles of railroad equipment, one complete field hospital, 20 wagons, thousands of dollars worth of signal, engineer, and medical property, many maps and secret documents, and other miscellaneous property. It is not known when Corporal Herbert Burnell Ward was killed that first day. It is hoped that he experienced some of the success of this major victory for the Americans, made possible due to his sacrifice. Corporal Herbert Burnell Ward’s remains were returned on May 23, 1921 [Source: Ancestry]. He was laid to rest in Ward Cemetery in Brunswick County with his family. A military flat marker is displayed. The Society of the Fifth Division (1919) The Official History of the Fifth Division USA, During the Period of its Organization and its Operations in the European World War, 1917-1919. New York, Wynkoop Hallenbeck Crawford Company. Barfie Randel Long was born and raised in Brunswick and Columbus Counties, NC. (His daughter’s birth record shows his name as “Barfield Randal Long.”) His findagrave listing and death certificate shows he was born in Columbus County, whereas his WWI Draft Registration and NC WWI Service Card shows he was born in Brunswick County. He had one brother who also served, Pvt Vanderbilt Long. In 1900, he and Vanderbilt lived with their family in Shallotte, Brunswick County. 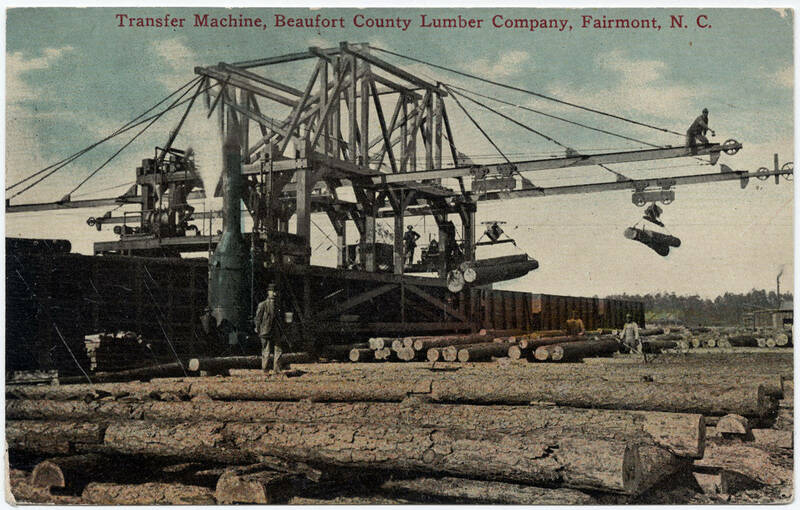 By 1910, they were both working on the family farm in Chadbourn, Columbus County, NC. His Draft Registration in 1917 shows he was single and working as a mechanic at RJ Reynolds Tobacco Company in Winston-Salem, NC. Barfie was ordered to report for duty on September 18, 1917 in Winston-Salem. He was accepted for service on October 16, 1917, at Camp Jackson, SC [Source: Ancestry]. A handwritten notation states that they were intended for the 321st Infantry of the 81st Division, but as previously included in the 81st Division history, many soldiers were transferred to other needed divisions. Pvt Long eventually was assigned to Company M, 6th Infantry, 5th Division. 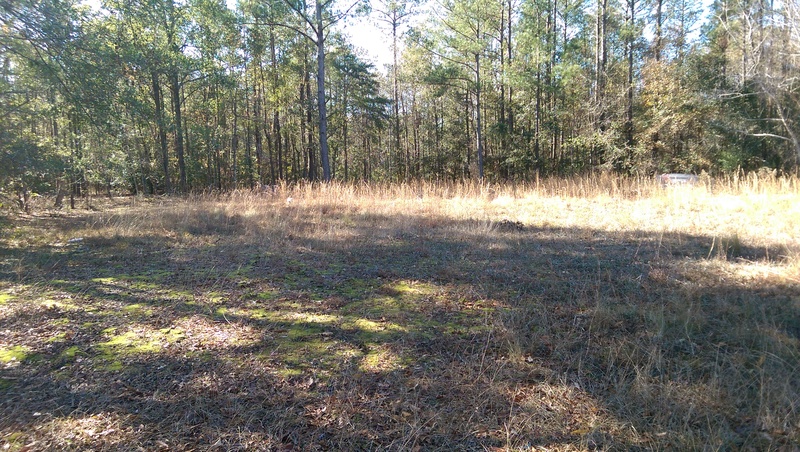 The division was not organized until December, and did not unite as a division until the following spring in France, so Pvt Long likely remained in SC or transferred to GA (Camp Forrest) where the 6th Infantry trained. Because it is not known when his transfer took place, it is not known exactly where he trained. 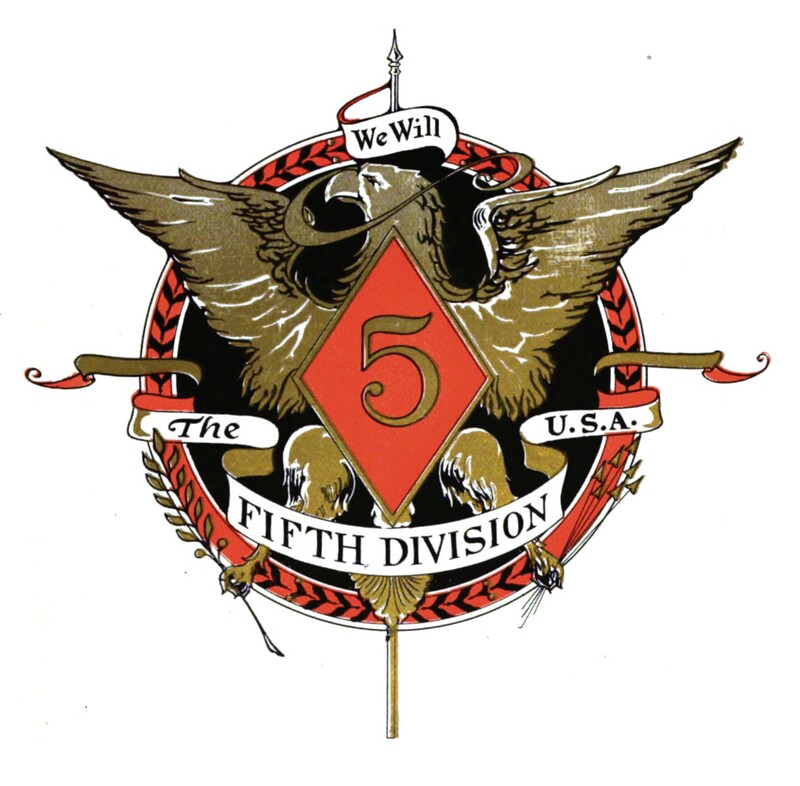 The 5th Division insignia is shown. 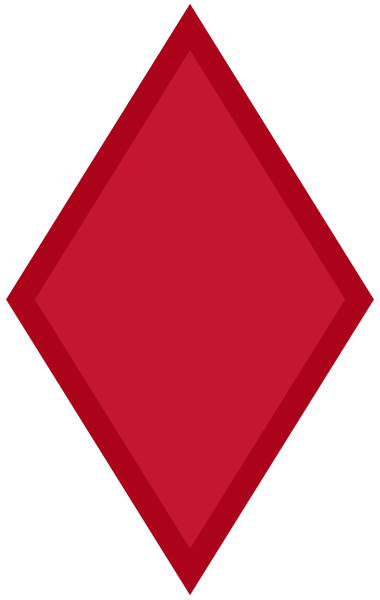 The nickname is “Red Diamond” or “Red Devils.” They were also referred to as “The Meuse Division” after WWI because of their crossing of the Meuse River and establishing a bridgehead in an area considered impregnable. The 5th Division’s capture of the riverfront and points east was called “one of the most brilliant military feats in the history of the American Army in France” by General Pershing. Some details will be shared in the WWI Profile of Pvt Owen Ransom Mintz. There are five known Brunswick County men who served with the 5th Division, as shown below. The rosters are also available on the World War I Army/Marine Division Rosters webpage. Pvt Long boarded Covington with the 6th Infantry on April 9, 1918, for France [Source: Ancestry]. The movement of the entire 5th Division overseas was piecemeal. The atmosphere of France was a shock after the cheer of England. Those days of April and May were grave and menacing to the French, for the Germans had launched their last great offensive that was to win or lose the war. As each unit arrived, it began immediate and intensive training for the front. They were introduced to the French method of conservation: not just concerning food, but methods of firing to save the largest amount of ammunition and construction using an economy of materials. In late May, the division was declared ready for introduction to the front. They were placed under command of the French and entered the Upper Alsace and Vosges Mountains as the first American troops in that sector. There they participated in patrols, and harassing and raiding the enemy. They experienced their first casualties in June and later a gas attack killed and wounded many. As the Americans became more familiar with trenches, the Americans took over command of the division. On July 15, the division moved into the St. Die sector. Here, the Germans controlled No Man’s Land. They had visibility of all American daylight movement. German airplanes were constantly monitoring. The 5th Division took a more offensive stand. Sniping was developed until the enemy dare not show himself. Hungry Huns attempting to reach their cabbage and vegetable gardens by crawling on hands and knees were often forced to scuttle to some protecting shelter by our snipers or machine guns turned on sensitive points. The patrolling and raiding grew bolder and stronger as the 5th Division became experienced in the trenches. Then the first real engagement was booked. The mission was to capture the village of Frapelle (bottom right on map), about 9 kilometers east of St. Die, as well as Hill 541, just north of the town. This mission was assigned to the third battalion of the 6th Infantry. (Third battalion includes Companies I, K, L, M.) Privates Barfie Long and John William Mills along with the rest of Company M were to lead the attack with Company L. Private Long was severely wounded during this attack. Use the map above to set the battle positions. 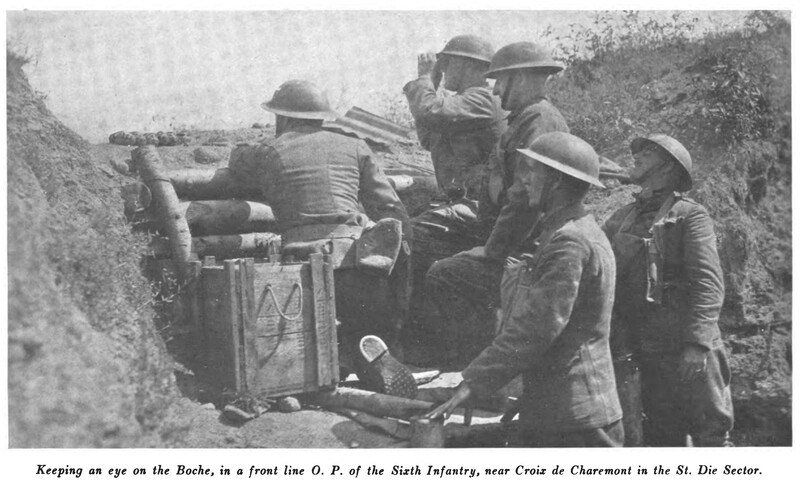 They were positioned just behind the lines at Charmont, about 1 kilometer west of Frapelle. The second battalion (Companies E, F, G, H) was at Nayemont, about 4 kilometers west of Frapelle. The first battalion (Companies A, B, C, D) was at Vanifoss on the Fave, about 4 kilometers southwest of Frapelle. Thirty-six batteries had moved up to concealed emplacements more favorable to fire on the area of attack. The Ammunition Train had moved ammunition and the 99th American Aero Squadron was ready to give air support. “H” hour was set at 4am of August 17. At 3:54am, the artillery opened up on the enemy’s lines with a heavy barrage. For ten minutes the rain of high-explosive and gas poured on the town of Frapelle and Hill 451, on the Hun trenches and on every known enemy battery. At four, the bombardment changed to a box barrage, smoke shells were thrown into enemy observatories, and behind the curtain of shell the infantry went over the top. Companies L and M led the assault while I and K occupied the trenches from which the former departed. Companies A and C were held in support. Each assaulting company was deployed in four waves and had “moppers-up” of engineers and infantry. A platoon of machine guns accompanied each company in its advance. Evidently the enemy was prepared for the attack, for his counter-barrage came down upon the departure trench at exactly 4:06am and caught the second, third, and fourth waves. With considerable losses the troops pressed through the heavy and accurate barrage toward their objectives. Company M encountered a heavy machine gun barrage on Hill 451 and was held up for a time. The lines were re-formed, the enemy was rushed and the height was won. Company L advanced without serious opposition and occupied Frapelle. With the aid of the engineers enemy shelters were blown up and dugouts and houses searched. No sooner had the troops gained their objectives than the German artillery was turned on Frapelle and Hill 451. At 6:30am the deluge of fire began, which lasted with varying intensity for three days and nights. 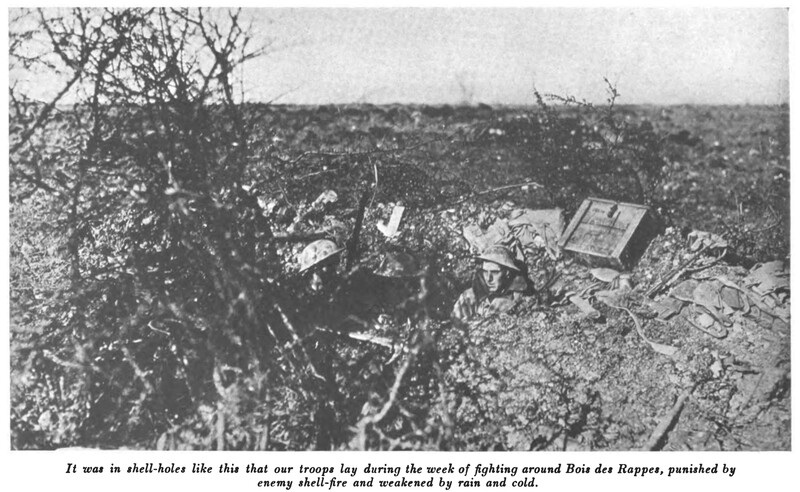 The men of the Signal Battalion had carried their telephones and wire over the top in the first assault waves, to establish communication to the rear from the forward command posts. So continuous was the shelling that the telephone lines had to be abandoned. Large quantities of gas were used, with concentration of mustard. 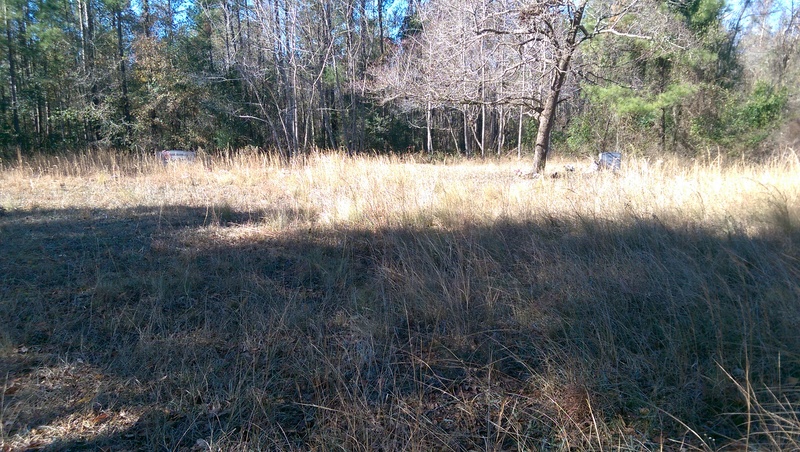 The wooded areas, overgrown with thick underbrush and filled with depressions, were drenched with fumes. Gas overcame many of the parties working at night on the entanglements and the trenches. The operation received considerable comment in the French and American press. It was the only change that had taken place on this front in three years. Over 150 of the wounded were gas cases. It is unknown what type of wounds Pvt Barfie Long experienced. Perhaps it was gas, given that he had several lung diseases at his death many years later. In addition, Pvt John W. Mills was reported missing in US newspapers on October 31. He was later reported found in reports published in newspapers in December. Newspapers were very much behind reporting casualties so it could have been from this operation or a later one, which will be covered in the next WWI Profiles of the 5th Division. Private Long returned with his unit in July 1919 and was honorably discharged July 29. A 1920 Census could not be located. The 1930 Census shows Barfie living with his mother in Chadbourn, Columbus County, NC, farming his land. His father had passed away a year earlier. 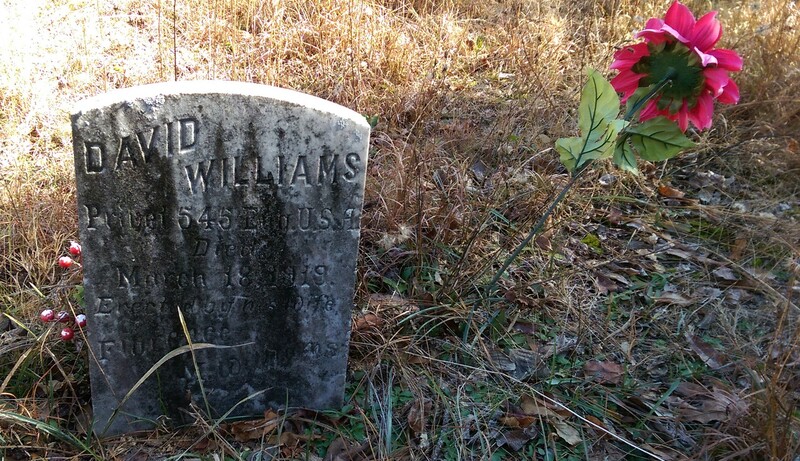 In 1936, his brother, Pvt Vanderbilt Long, died of influenza at age 41 and was laid to rest in Chadbourn, Columbus County, NC. The 1940 Census shows Barfie now married to Emma Louise Long, age 20, from SC. They had a two year old daughter, Helen Elizabeth Long, born in NC. Barfie’s mother is still living with him. Barfie continued to work his farm. At age 51, November 6, 1947, Barfie Randel Long passed away at the Veterans Administration Hospital in Oteen, NC, near Asheville. He had multiple diseases of the lungs. The Asheville Citizen-Times published an obituary on November 8, 1947, on page 2. Barfie R. Long, 51, of Chadbourn, Columbus county, a veteran of World War I, died yesterday morning in a hospital here following a long illness. Surviving is the widow, Mrs. Emma Long. The body was sent to Chadbourn for funeral services and burial. Morris-Gearing and Black funeral home was in charge of arrangements. His mother applied for a military headstone, which is in Chadbourn, NC, where Pvt Long was laid to rest. His mother was laid to rest near him at her death in 1959 at age 89. Records of his wife could not be found, nor is it known whether they had more children. However, his daughter married and raised a family in Brunswick County. Lennox Walker Clemmons was born and raised in Lockwoods Folly, Brunswick County, NC. There is a family tree in FamilySearch. Walker’s father passed away in 1911, leaving his mother to raise many children alone. 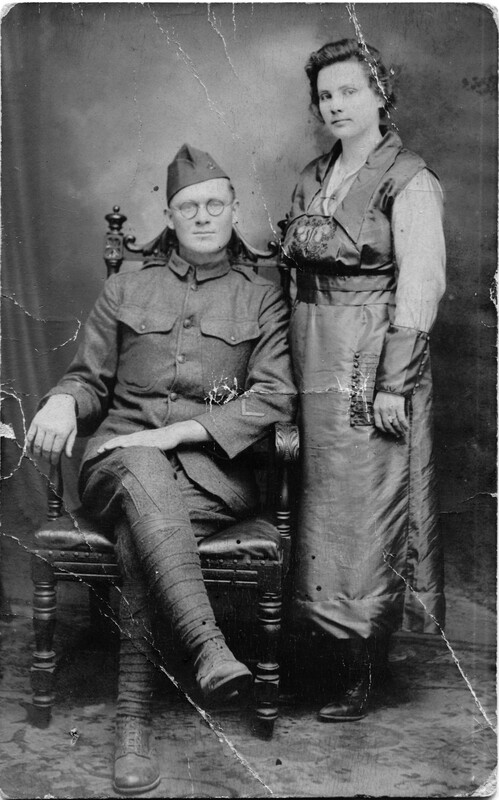 When Walker registered for the WWI Draft he indicated he was 25, single, and farming for his mother, partly responsible for her. It appears that he was the oldest son living at home at the time. Lennox Walker Clemmons was ordered to report for military duty on August 7, 1918. Walker’s name was typed incorrectly on the Brunswick County Board List excerpt as shown (Leonix Walker Hewett). There are three methods to verify this is Lennox Walker Clemmons. An excerpt from his WWI Draft Registration has been edited to highlight the handwritten number on the top left “651.” This can be matched with the highlighted typed number on the Brunswick County Board List. The second method is using compiled alphabetical county board lists located in the NC Archives. “Leonix W. Clemmons from Supply” is listed. Of course, you can also see these dates on his NC WWI Service Card. 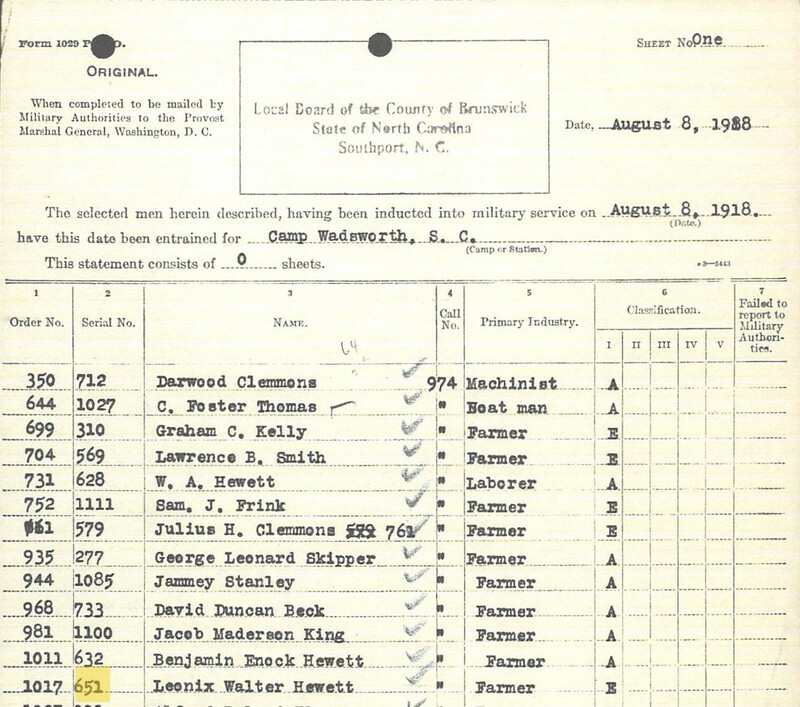 Pvt Clemmons trained in Camp Wadsworth, SC, along with the other Brunswick County men listed in Kendrick Outlaw’s WWI Profile. 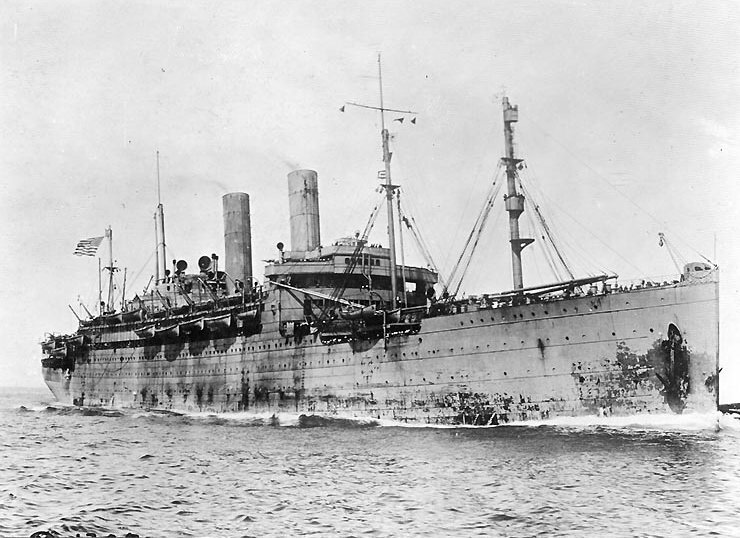 He embarked with them for France on September 15, 1918. As mentioned in Elijah Milliken’s WWI Profile, there is no known documentation describing the operations of the 55th Pioneer Infantry. It is also not known whether Pvt Clemmons transferred to the 81st Division for their final operation. Although his NC WWI Service Card does not show he did, it is not sufficient to discount the possibility. If Pvt Clemmons participated in the grueling hike of the 81st Division as described in Craven Ledrew Sellers’ WWI Profile Post, then it may explain why Pvt Clemmons returned to the US on a Convalescent Detachment from Bordeaux, France. He could also have suffered from gas exposure or the influenza pandemic. Note: The photograph above of Pvt Clemmons shows him with a gold service stripe on his left sleeve. The stripes are awarded after 6 months overseas service. Walker Clemmons married in early 1920. The 1920 Census shows he was living with his mother, wife, and some siblings, working on his mother’s farm. His mother passed away in 1929. A year later, the 1930 Census shows that Walker and his family lived in Southport. He was working as a mechanic. When Walker’s first wife passed away, he remarried and settled in the Winston-Salem area. Lennox Walker Clemmons passed away on November 1, 1980, in Winston-Salem. 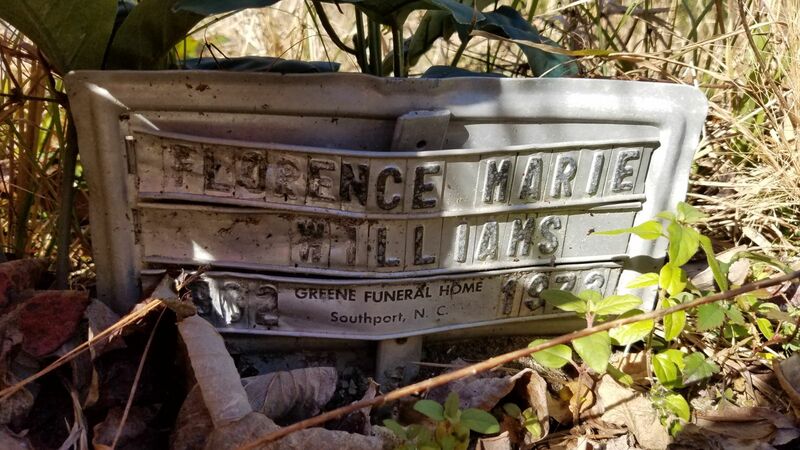 He was laid to rest in Gardens of Memory Cemetery in Forsyth County, NC. No indication of military service is shown.